When I was little I loved helping my Mum out with drinks parties. It felt exciting and somehow glamorous to be staying up late, dressing up smart and pushing trays of canapés round a room of grown-ups, eavesdropping on their conversations and sipping soft drinks from my very own champagne glass. And then there was the food – making it in advance with my Mum, arranging salamis and cheese straws on plates or punching cocktail sticks into a melon (this was the ’80s, after all), offering plates of treats to guests and seeing the smiles on their faces with that very first bite. One of the tasks I often ended up with was peeling quail’s eggs. We’d serve them with a little bowl of celery salt or fennel seeds for dipping: sawdusty but delicious and one of my favourite ways to eat eggs. In the spirit of home grown child labour, my Mum always said that my little hands were better for this fiddly job and I never resented it – it’s only when I decided to make my own Scotch quail’s eggs this weekend that I realised exactly what she meant. Scotch eggs are so much more delicious with a runny yellow yolk so I boiled twelve tiny eggs for little over a minute before plunging into ice cold water and peeling. More than twenty minutes later I had ten shell-free and two disasters – at around two minutes per egg I’m pretty sure I’d have gone mad if I’d attempted any more. 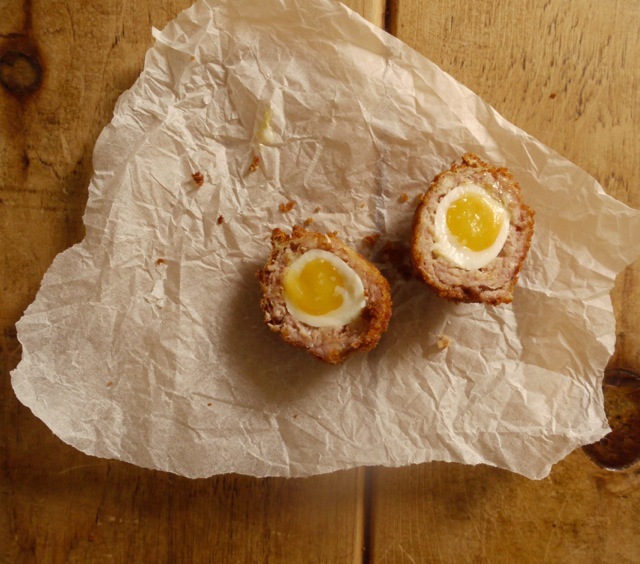 If you’re going to make this recipe, bear in mind that a soft boiled scotch quail’s eggs is a labour of love worth attempting for your nearest and dearest only (if you’re prepared to cook them a little longer, you’ll have more stability on your side). Once each egg is peeled, the rest of the recipe couldn’t be simpler. Split open some of your favourite sausages and squeeze out the meat. Season with herbs and spices of your choice – thyme, nutmeg, sage, rosemary, fennel and/or paprika in almost any combination are pork’s best friends – then wrap each egg in a blanket of meat before dipping in the classic trio of flour, egg and breadcrumbs to deep fry. A few minutes in sizzling oil and you’ve got a crispy crust, salty sausage and an oozing egg middle. Finish off with a sprinkle of sea salt, some chopped parsley and a bowl of homemade aioli for dunking. Poshed up party food at its very best. Crisp Scotch quail's eggs with an oozing yellow middle - perfect finger food for picnics, parties or snacking just because. Bring a small pan of water to the boil. Add the quail's eggs and boil for 1 - 2 minutes (the longer you boil them, the sturdier they will be to peel). Remove from the heat, strain and run cold water over the eggs until cool to the touch. Very carefully peel - if you leave the membrane beneath the shell intact, they should be a little sturdier. Split open the sausages and squeeze out the meat. Add the herbs, paprika and a few grates of nutmeg. Season with salt and pepper. Divide the sausagemeat into 12 equal sized pieces. Roll each into a ball then flatten out in the palm of your hand. Wrap the sausagemeat around each egg, rolling so that none of the egg white shows. 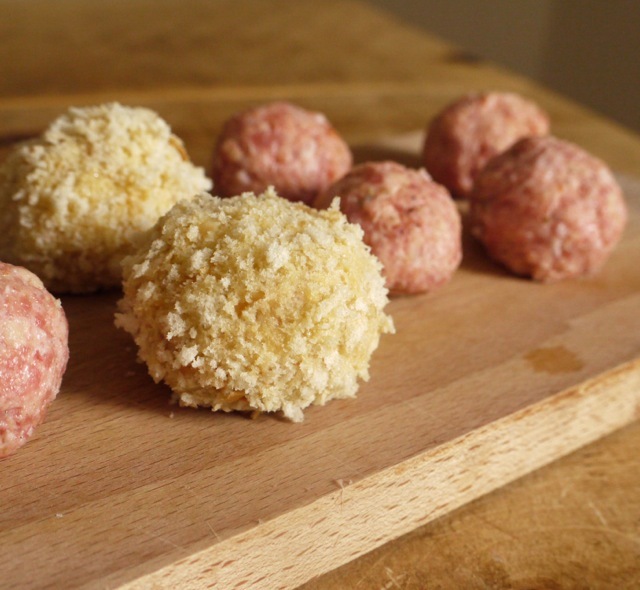 One at a time, coat each ball in flour, dip in egg then roll in breadcrumbs. Place on a tray and refrigerate while you heat the oil. Fill a large, deep-sided saucepan one third full with vegetable oil, about 150ml. Heat until a small cube of bread thrown in crisps pretty much instantly, then fry the eggs 3 - 4 at a time, turning occasionally. They should take 3 - 4 minutes, depending how big you've made them. Remove the eggs to a piece of kitchen roll using a slotted spoon. Allow to cool for a few minutes then slice in half, sprinkle with sea salt and parsley and serve with aioli, if you like. Tip: put several eggs in a jar or tall glass with a splash of water and shake. This breaks up the shell, and the water helps separate the membrane from the egg. They peel like a dream! eeeee!!! these are soooo cute!!!!!! 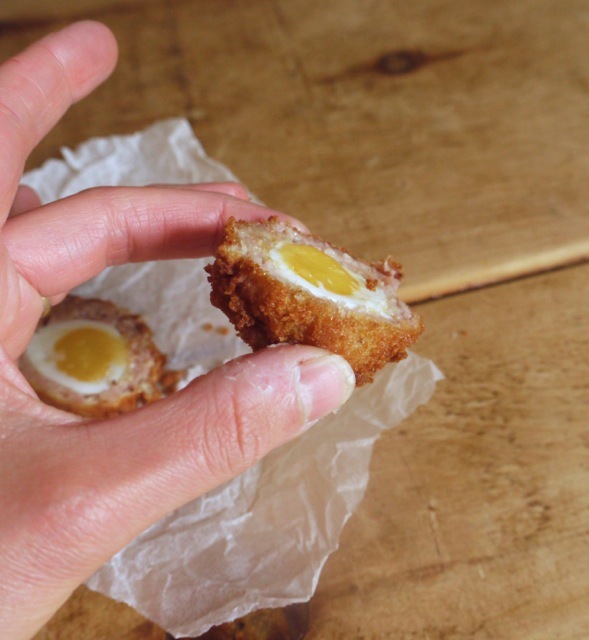 Even the teeny tiny quail’s egg version looks pretty huge once wrapped in sausage and breadcrumbs! But yes, definitely less madly enormous than a regular scotch egg. Scotch eggs are one of my favorite indulgent party foods, and they’ve become quite popular in the US. I love them in miniature with the quail eggs! 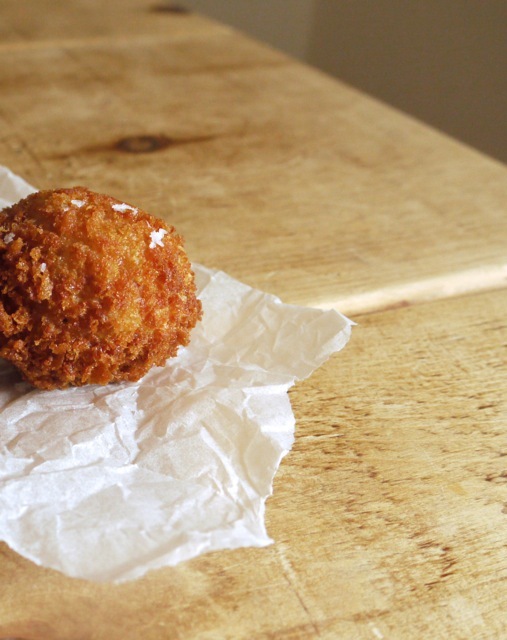 I’ve had runny-yolk Scotch eggs and hard-boiled, and there’s absolutely no comparison. Wow, truly a labour of love! Even wrapping the soft boiled egg in the sausage seems like a delicate procedure… A couple of years ago I tried making soft boiled quail eggs and I managed to break most of them while peeling. My sister has been trying to get me to experiment with making a smoked haddock Scotch Egg with fish instead of sausage meet. Apparently she had it in a restaurant with a light curry sauce and it was delicious…. Kate, what a cute idea! 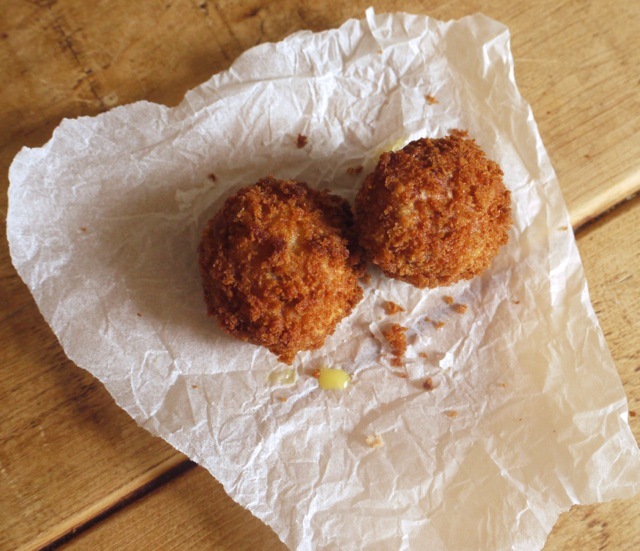 I love Scotch Eggs and I love quail eggs… putting the two together – so clever! I just saw Emma Gardner here in California, I told her to say hi to you next time you get together. I wish I could pop on a plane and share a meal with you guys too! Ah, well I have dreams of visiting California again (I went once when I was about 15). If we make it over there I’ll make sure to let you know! The last time I made Scotch Eggs was in Home Ec in First Year of High School – these look ever so slightly more grown up than the ruskoline coated, oddly shaped versions I came up with! I have been wanting to try making my own Scotch eggs for a while now and your gorgeous photos have refuelled my craving! Must give it a try soon. I’ve been wanting to make scotch eggs for so long, but they always seem huge. I can’t believe I never thought of quail eggs before. Any tips/tricks on peeling these? Plunge them into cold water and roll gently in the shell before trying to peel it off. Hope that helps! Either put them in a jar of cold water, and shake, shells come off easier, but when leaving the yolk soft, it is best to tap the bottom of the egg, as there is an air pocket, and work from there. Also try a small wet teaspoon.